Falcon presents a rod series made for a true champion. 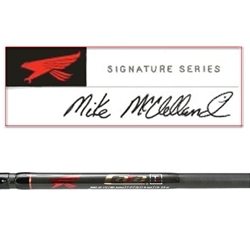 Bassmaster Elite Professional Mike McClelland. Built to Mike's demanding specifications, these rods perform no matter the conditions. Jerk Bait- Mike specifically designed this rod to fish suspending jerk baits but it also works well for small crankbaits and popping style top-waters. Swim Jig- Mike says this is "the" all-purpose rod. Throw a spinnerbait, swim jib, fluke, or jig. Use it for almost any shallow water application. Heavy Cover Jig- This is the best "football jig" rod Mike has ever used. You can also fish a big spinnerbait or Carolina rig with it. Flippin' Stick- A true flipping stick, Mike uses this Cara to flip grass, brushes, and any other heavy cover you come across. Mike Specifically designed this rod to fish suspending jerk baits but it also works well for small crankbaits and popping style top-waters. This is the best "football jig" rod Mike has ever used. You can also fish a big spinnerbait or Carolina rig with it. A true flipping stick, Mike uses this Cara to flip grass, bushes, and any other heavy cover you come across.